Savio will exhibit in Shanghai energy saving and industry 4.0 solutions in the winding segment: Polar Evolution and Eco PulsarS winding machines, plus an industry 4.0 corner with smart solutions for mill monitoring. Since 1911, the Italian manufacturer Savio is specialized in the yarn-finishing segment, being the leading supplier of winding, twisting and rotor spinning machines, with manufacturing plants spanning over Italy, China, India and Czech Republic. Polar Evolution winding machine: a high performance, energy saving and less labor-intensive product for the Chinese customers. The machine on display will be a round magazine feeding one, provided with an efficient and fast automatic doffer. Eco PulsarS: with its innovative platform can save up to 30% power bill thanks to “Suction on Demand” system. Eco PulsarS winding machine, with its sustainable eco-green advantage, replies to the market demand of energy saving, including room air conditioning, together with improved production performances, high quality packages and utmost automated solutions. Energy is a major cost component in the textile industry. The rising energy prices, affecting fuel and electricity, have caused soaring costs in the process, thus reduced the competiveness of textile products in some domestic markets, where imported products may be cheaper. Suction represents 75% of the total energy of a winding machine. EcoPulsarS’s solution of the “individual and independent suction unit per spindle” represents a real break-through versus the conventional system. Each unit operates at optimum suction values without influencing the rest of the spindles. This means no more compromises in balancing the suction as in conventional centralized systems, in which the fan is permanently in operation. Since suction is generated only when needed, customer can save up to 30% power bill costs, while a better efficiency, a smoother winding process and overall superior package and yarn quality are achieved too. Reduction of noise is another key aspect. EcoPulsarS combining all new features and design has created an environment in which each part of the machine can operate at its optimum level. Spindles and bobbins feeding systems set independently the level of suction required. Suction is generated as needed and used without losses. The new Controlled Cut System, Yarn Tension Control System, Waste Collection System and Upgraded Splicing Solutions, each contribute to the overall reduction of noise and process downtimes. The Savio Direct Link System (I/DLS) solution, for linking the ring spinning frames (RSF) to the winders, enables a fast and efficient direct feeding of bobbins, along with the full interfacing flexibility with all kind of RSF. 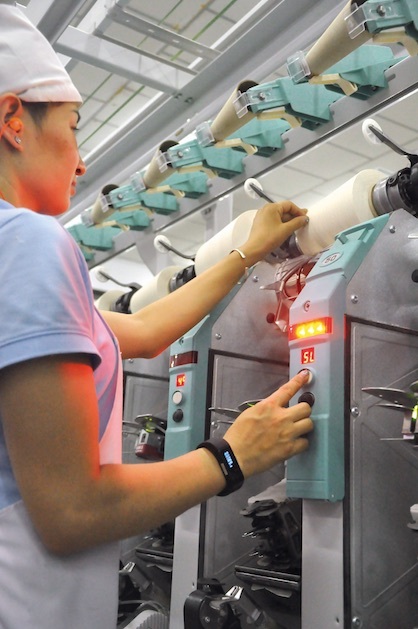 From RSF bobbin to the final package, the yarn is processed untouched and with zero transit time, ensuring maximum quality, less material handling and no chances of contamination. Many important markets are investing on this kind of high-automatic systems for the production advantages that such solution offers, but also for guaranteeing the end-product quality. In order to satisfy each new developments on ring frame design, Savio Direct Link System has been designed in a “modular type” granting the possibility of reaching the highest number of winding heads, to match the trend of the spinning frame manufacturers with longer and longer machines up to 2.000 spindles.